out on the tiles with hip tite. 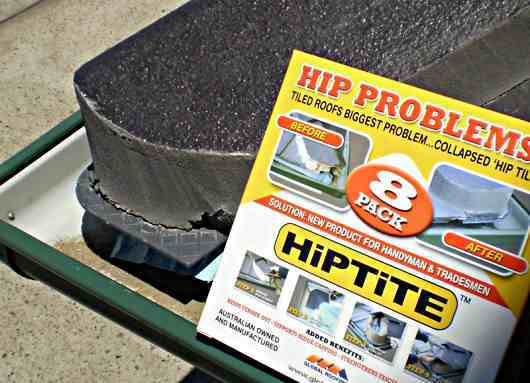 Hip Tite-The black plastic hip tile starter fixture in action. Hip Tite - The fitting is screwed or nailed to the fascia. HIP TITE - WHAT'S IT DO? 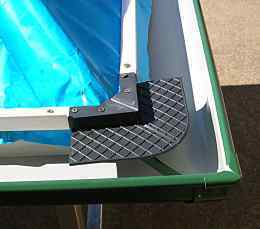 Provides a platform for cement placement where the hip tile hangs into the gutter. It's the blot on most roofer's copybooks. There's not enough support for the starter and row starter tiles on the corner of the roof so you balance them against one another, or prop them up with some scraps of fibro while the mud is setting and pray to your God of choice it all somehow holds together. Only in 30 per cent cases it doesn't. The tiles collapse in on themselves or crack. Cement runs into the gutter. 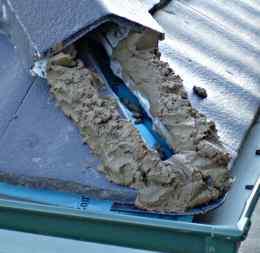 Birds, rats and possums make their way into the eaves of your client's home via a hole in the hip-starter tile. After Sydneysider roofer Peter Doherty, 46, discussed every roofer's secret shame with his inventor neighbour Greg Hay, 46, the Hip-Tite was born. "It's a ridge-cap starter tile fixture," Greg explained. 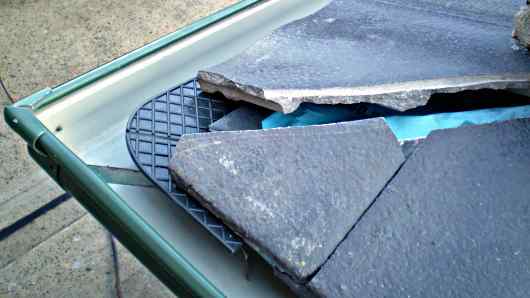 "If you're retrofitting it, you remove the old Hip tile, chip off all the old broken cement, place the Hip-Tite onto the fascia with the aid of nails or self-tapping screws. 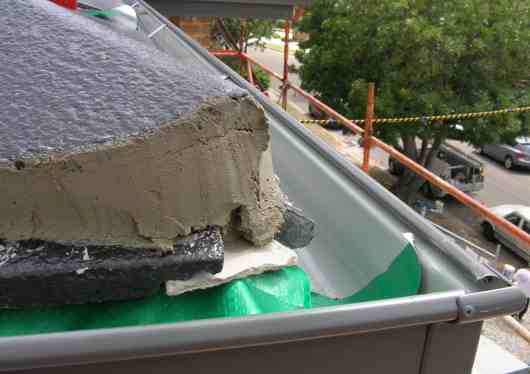 If it's an aluminium fascia place the new cement down the tiles and onto the platform then bed the hip-tile into the cement and smooth off." Beauty, not only will your customers be free of waterstained eaves and possums in their attic, you'll save more time and make more dosh. "Tilers no longer have to fit small pieces of tile right up to the last inch and fiddle around cutting small pieces with a tile cutter. And of course you'll no longer be scratching around looking for building waste to prop up the tiles. And you can even charge extra because your providing people with a great solution to an obvious problem." Hip Tite - The finished job, compare with the photos below. Hip Tite - A typical problem with the old way. A convenient hole for vermin to enter your roof. The starter fixture solves this. Hip Tite - The traditional way of finishing the end of the tiles at a hip corner. Plastic in the gutter to protect it from the cement, then pack up odd bits of scrap any old way to stop the mortar from sagging. The email address above is your way to contact Greg and Peter, as you can see it is not clickable, but an image. I am sorry but you will have to copy it by hand, as otherwise the guys would very soon get swamped by spam. I like this one, it's a practical solution to a niggly problem. 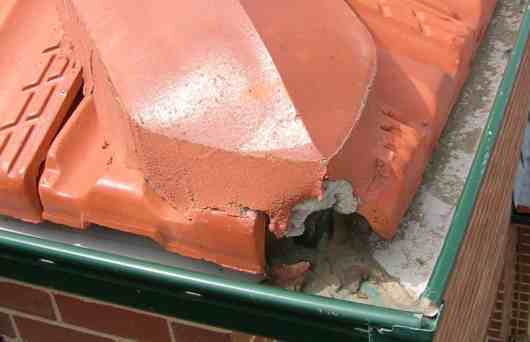 Keeping vermin out of a roof space is mandatory under the BCA and rightly so. I've seen electrical wires and PVC water pipes eaten through by rats. I've seen a house with no pets, infested with fleas because of possums nesting inside the roof. The cement tile few roofs that I have done have all been fixed by sub-contractors working for the tile supply companies, so it has not really been my problem, if they do a bodgy job, they fix it. (Of course it was a problem for the subbies, but it was really a problem caused by the tile manufacturer not addressing the issue). However, we have been known to get the odd storm where I live, and after one a couple of years ago I had to fix a bit of tree damage to my mates tile roof. I had to cut the new end tiles at the hip with a diamond blade in my grinder, and working partly on the roof and partly on a ladder I had to nail blocks of wood to the fascia to support the small cut tiles because there was no gutter. After the job was done, somebody had to go and remove the support blocks when the mortar had set. (My mate did that, but it could easily have meant another trip for me}. I would have bought a pack of eight Hip Tites from Bunnings just to make that one corner repair easier. Leave hip tite and back to home page.